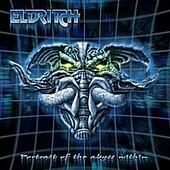 ELDRITCH plays a powerful and vital strain of progressive metal. Unlike so many of their peers, there is no compromising of power and heaviness on Portrait of the Abyss Within. In fact this album owes as much to robust 80s thrash metal as it does to the more subdued (yet tuneful) approach of post Y2K prog metal. While many prog bands are trying to catapult their sound forward with orchestral embellishments or by pandering to the atmospherics of dark metal; ELDRITCH seem content to see what they can do with superior song writing and a powerhouse delivery.